Having a positive body image can be easier said than done. Unfortunately for many young women, struggles to look perfect are a way of life; their body size or shape a sign of personal failure. Their body becomes a place for punishment— how little can I eat? how much cardio can I do? —rather than something to be proud of. Competitive powerlifter Leanna Carr was one of those women. Until she discovered lifting and realized that what her body could do— which includes an impressive 305 lb. squat, 170 lb. bench, and 350 lb. deadlift— was far more important than any number on the scale. Carr, who balances powerlifting with being a WNBF Pro Figure competitor, is also one of the creators of Iron Woman Strength and has become a powerful inspiration on social media. 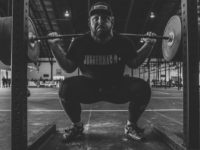 Here, Carr delves into how she stumbled on powerlifting, her past issues with body image and becoming comfortable in her own skin. Athlete Daily: You’ve competed in both powerlifting meets and figure competitions? That’s not very common. How did this all start? Carr ended up winning her division at her first figure show. “I went out to eat after and had my ‘cheat meal’. I did a very restrictive prep, did not count macros. I remember sitting in the car in traffic on the way back from the gym eating a bag of lettuce and crying. I was supposed to do another show after that, but just couldn’t get back on it. I had that one taste of a “free cheat meal” and because of how food-focused I was during that entire prep and how deprived I was, I just couldn’t do it. I felt like everything I had learned about being healthy and about nutrition went out the window. I put back on 10-lb., I was probably in the best shape I had ever been in my entire life, but I was also probably the most critical of my body, of the way I looked. I was so focused on how I looked, afraid of people possibly judging me for gaining some weight. Just a very unhealthy mindset. At the time, I hadn’t ever really thought about it, it was way before powerlifting was even big. There weren’t very many females who were powerlifting at the time. Athlete Daily: That was your first time lifting? Carr: “That was really my first time really squatting heavy. The guys on the team were like ‘You have to keep doing this!’ So, I did. Ended up going to practices over the summer, fell in love with lifting in general. 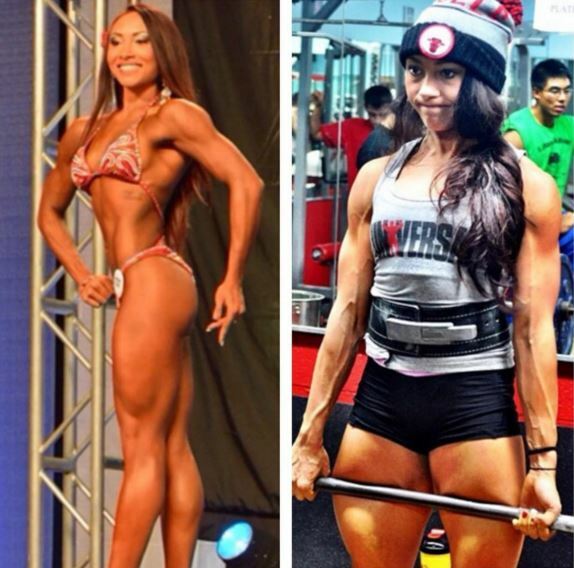 Athlete Daily: And you continued to do figure competitions? Leanna: “About two years later, I felt like I was in a good place mentally to do figure again. I had a bad first experience, but being on the stage was something that I really enjoyed, too. I liked the dedication and the discipline being in the contest prep gave me. 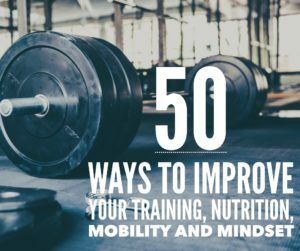 Carr’s first coach told her not to do both and that a jack-of-all-trades is the master of none, meaning she would never be a top physique competitor or a top powerlifter. But Carr didn’t care to be either at that point in her life. Athlete Daily: What mistakes do you see in powerlifting training? Leanna: “A lot of powerlifters train with specificity—bench, squat, deadlift—BOOM. Because that’s what you’re trying to get good at. You’re not trying to get good at bicep curls. So a lot of powerlifters won’t do any accessory movements, because they think the extra volume isn’t going to do anything. [They think] it’s not helping them achieve what they want to achieve. But obviously the bigger your muscle is, the stronger it’s going to be. Athlete Daily: Do you use accessory lifts a lot? 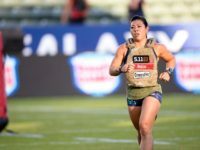 Athlete Daily: What prompted you to start your own business, Iron Woman Strength, geared around programming? 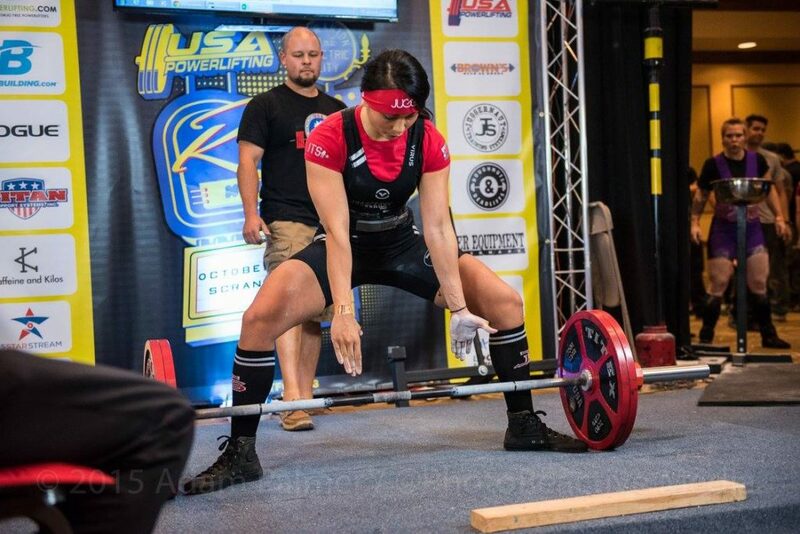 Leanna: “I knew nothing about the sport of powerlifting [when I started.] It was, ‘this seems fun, let’s lift heavy’. That’s why I started my business (Iron Woman Strength) because whenever I got into powerlifting, I didn’t really know where to go. Obviously, you can Google powerlifting, or look on YouTube, but I had no idea where to begin. When I started, I got a lot of emails from women saying ‘That’s so cool what you’re doing; I want to get into powerlifting too, but I’ve been looking online and this website says one thing and this website says another.’ So, that kind of inspired the idea behind my website, which is a member website, an all-encompassing resource for members. Athlete Daily: Who does the programming? Leanna: “Myself and my coach/business partner Brian Minor. What really stuck out to me was that, he’s the kind of coach that didn’t just say ‘Here’s your program, here’s your nutrition’ and just have me blindly follow it. From the get-go he was really good about describing and explaining to me why he programmed this a certain way. [He] basically gave me the information I needed not only to do the program, but to progress on my own as an athlete. For more on Leanna Carr’s programming check out Iron Woman Strength.com. body image, bodybuilding, diet, figure competitor, flexible dieting, juggernaut training systems, leanna carr, macros, nutrition, powerlifting. Bookmark.